Naturally Inspired Grants recipients announced! NRM South, Southern Tasmania’s natural resource management organisation, today announced the recipients of $110,000 in funding within the region as part of the organisation’s annual Naturally Inspired Grants initiative – funded through the Australian Government’s National Landcare Programme (NLP). Naturally Inspired Grants offer community groups, not-for-profit organisations, schools and individual land managers the opportunity to undertake projects that deliver positive environmental change in the Southern Tasmanian region. NRM South received a large number of submissions of an impressively high calibre which were assessed against environmental and sustainable agriculture criteria aligning to the National Landcare Programme and regional priorities. The 34 recipients of this round include 11 community groups and 13 landowners sharing in just over $110,000, with funding of up to $5,000 awarded per project. Selected projects will also be supported via NRM South and Landcare Tasmania’s collaborative regional Green Army team, providing assistance to the community for on-ground action, as well as helping Green Army team members to actively learn through hands-on experience. Eleven community groups were funded for a diverse range of projects including marine debris clean up activities, weed surveys and control, native revegetation and raising awareness of environmental issues – including via natural values signage, interpretative trails and community events. 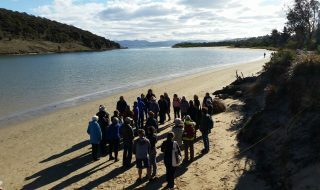 Bruny Island is a nationally recognised hot-spot for biodiversity and has benefited accordingly with three community grant projects being awarded, including to the Bruny Island Community Association for their Community-Based Wildlife and Feral Cat Monitoring program. This project will establish a community-based awareness and monitoring program using remote cameras to monitor wildlife and pest species on private property on Bruny Island. It is hoped the project will be a part of a broader trial and offer a model for community based wildlife monitoring across the state. Another collaborative, community based project involves the Midlands Tree Committee who are supporting sustainable agricultural practices and increasing awareness of environmental issues such as tree decline in the Southern Midlands by assisting private landowners with weed control and native plant revegetation. NRM South CEO Donald Coventry says projects like this were typical of the calibre of applications received this year and acknowledges the diversity and enthusiasm of this year’s recipients. “I would like to thank all applicants for their time and effort in applying for this year’s round. We received many impressive applications addressing both sustainable agriculture projects and those focused on environmental activities. Importantly weeds continue to be a concern for both landowners and community groups, as does the importance of preserving areas with significant biodiversity and threatened species, and as such both have received attention in this year’s round. This year, thirteen landowners were successful in receiving grants to undertake works such as riparian rehabilitation, protecting remnant vegetation for threatened species, reducing nutrient run-off, managing environmental weeds and improving soil health. One example of a successful project is Little Golden Farm in the Huon Valley, who will be trialling an integrated approach to improving soil and horse health through a combination of improved grazing management and regenerating soil health. Their pasture management field trial aims to maximise grass production and increase biological activity, water filtration and soil carbon, and the outcomes will be shared at a community field day at the completion of the project.